In my 10+ years of charting Elliott Wave, I have rarely encountered a market as challenging as this one. Fourth waves are notoriously difficult trading environments, and I know many Elliotticians who simply refuse to trade at all during a fourth wave. 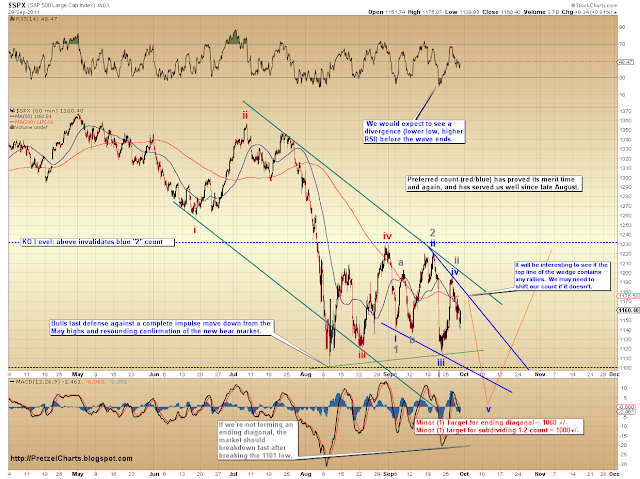 While the true intentions of this market on the larger time frames remain somewhat veiled, we can take heart from the fact that we have thus far called virtually all of the turns accurately using shorter time frames and kept our readers on the right side of the trade since early August (even before we started this blog, we were posting accurate turn forecasts on other sites). Yesterday's action followed our 1-minute chart very well, however it created a situation where the potential first and fourth waves overlapped. This has caused us to shift the preferred labeling from a simple wave (ii) to a complex a-b-c wave (ii); specifically, a running flat (blue labels). If this view is correct, it should complete anytime within the red target circle (meaning it may already be complete, or nearly so), and turn down sharply from there. The price action has also unleashed a flurry of other potentials, the front-runner being that we just saw a leading diagonal first wave (gray labels). I am not going to address all the other possibilities until the market gives us more reason to, however the move needs to begin accelerating downward very soon for the blue nested 1-2 count to maintain viability. 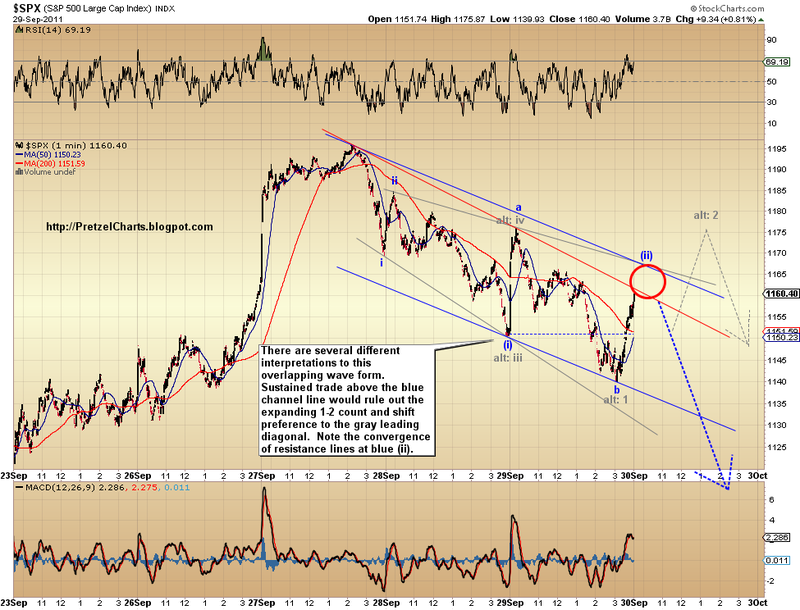 If the 1-2 count is occuring, that would put the target destination for the third wave in the 1090 neighborhood. 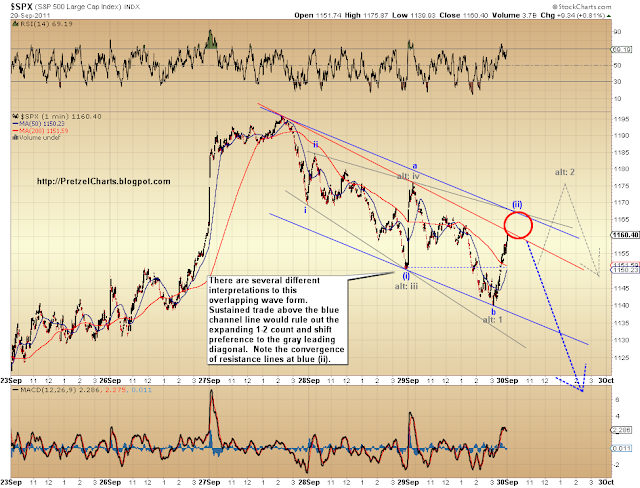 Sustained trade above the blue channel on the 1-minute chart would be our first clue that the 1-2 count has likely been negated, and preference would shift to the gray count, which would have us forming a larger rally into the 1175 area before resumption of the downtrend. Sustained trade above that area would give warning that one of the other myriad possibilities still present in this clusterf*dge market is likely to unfold... but as I said earlier, we'll burn that bridge only if we come to it. 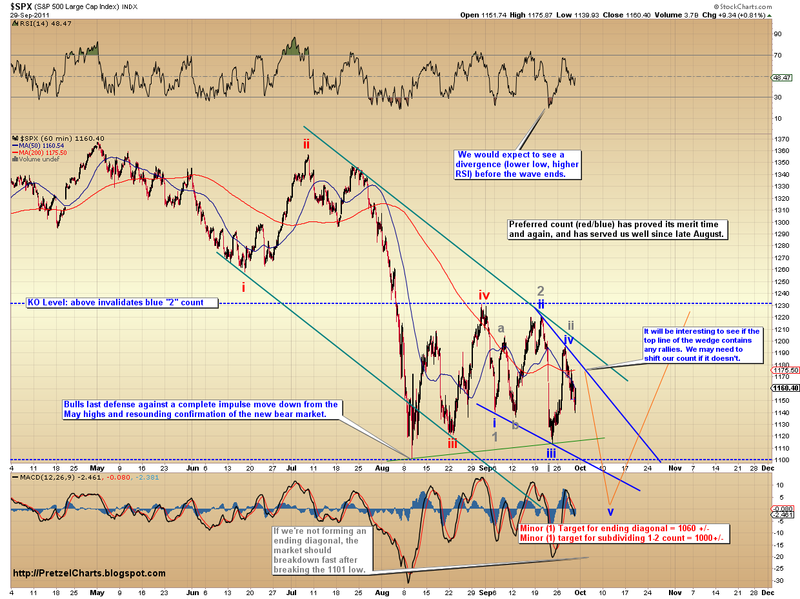 So the main count has a 1090 downside target before a rally begins, and the alternate count has either 1050 or 1000? I mean 1060 or 1000. Neither count has 1090 as the final target, sorry for the confusion (I see where you got that; I was referring to the target for one of the third waves). The two counts I am watching are the ending diagonal, with a target of 1060, and the nested 1-2 count, with a target of 1000. Both targets are preliminary, and I will let the structure determine the final target, which I will post as the waves get closer to completion.